The team is looking for speakers from across our community. The overarching theme for this year’s event will be announced in upcoming months. 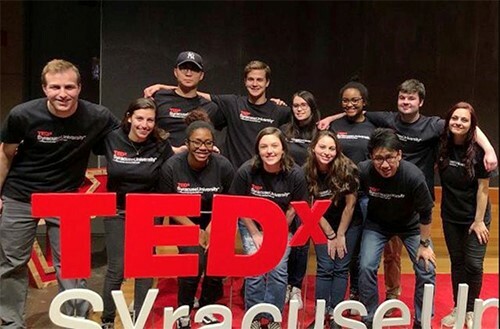 TEDx Syracuse University’s 2019 event is slated to take place on April 6, 2019, in the Slocum Auditorium. To nominate a speaker, simply fill out this form by Dec. 3, 2018. Questions can be directed by e-mail to Sarah Grinnell, communications coordinator, or Ariana Rassooly, co-lead organizer and head of curation at tedxsyracuseu@gmail.com. Sponsorship for the TEDx Syracuse University event is provided by the Ruth Ivor Foundation, the School of Information Studies and the Blackstone LaunchPad at Syracuse University.